A pamphlet anthology of 20 poems submitted by Surrey poets to our National Poetry Day competition: it was launched on the day, Thursday 4th October in Waterstones Bookshop, Guildford High Street. We're very grateful to Waterstones for their gift of a £25.00 book voucher to the winner of the competition, and for allowing our event to take place on the shop floor. The winner was Belinda Singleton and runners-up were Kitty Coles and Ian McLachlan. CONTRIBUTORS TO "WHAT THE ELEPHANT SAID TO THE PEACOCK"
This is the sixth annual Dempsey & Windle anthology of poems by competition winners and invited contributors. This year's long-listed and winning poems from the Brian Dempsey Memorial Competition comprise the first section of 44 poems and the second section consists of 13 poems by "guest poets"
Contributors: Derek Adams; Bryan Baker; Wanda Barford; Trisha Broomfield; Anika Carpenter; Selma Carvalho; Arthur de Lisle; Amy Deakin; Said El Majdalawi; Hilary Evans; Wendy Falla; Clifford Forde; Robbie Frazer; Charlotte Harker; Richard Hawtree; Georgia Hilton; Patrick Holloway; Martin Jones; Terry Jones; Nigel Kent; Bernard Kops; Andy B J Low, Jeremy Loynes; Valerie Lynch; Konstandinos Mahoney; Elizabeth McHale, Ayelet McKenzie; Joan Michelson; Heather Moulson; Mark G Pennington; Alan Pepin; Nicky Phillips; Geoffrey Pimlott; Jenna Plewes; Ray Pool; Caro Reeves; Rachel Reeves; Marka Rifat; Greta Ross; David Russomano; Chrys Salt MBE; June Sanders; Abbie Saunders; Nadia Saward; Richard Sellwood; Jac Shortland; Fiona Sinclair; John Smith; Anthony Spice, Maria Stephenson; Kathleen Strafford; Duncan Taylor; Georgina Titmus; Gareth Toms; Peter Viggers; Alan Waddell. The launch of "What the Elephant Said to the Peacock" was on July 9th 2018. 30 contributors read to the audience: over 50 people came and we thoroughly enjoyed the evening. Go to our facebook album for individual readers' photos. The anthology based on our annual competition, the Brian Dempsey Memorial Prize Competition, has an international flavour this year and includes work by poets from France, Switzerland, Spain, USA, Singapore, India and Bulgaria, as well as all corners of the British Isles. Fifty-five poets are represented; the collection includes the winners and long-listed poems from the competition and also pieces from eleven other "guest" poets. This year we set up The 1000 Monkeys Poetry Competition and were delighted with the response from poets, both local and further afield. From the many excellent poems submitted we've edited this anthology, and added some poems by our personal favourites too, to make an anthology of poems by 42 writers associated with the "1000 Monkeys" group of writers and poetry performers, most from Guildford and the surrounding area. The first half of the anthology is devoted to the winners and runners-up in the 2016 competition. The competition was judged by Alywn Marriage, who also has poems published here. Guest contributors from beyond Guildford include Chrys Salt MBE; Bernard Kops; Steve Pottinger; 'Ghareeb Iskander, Wendy Klein and Bethany Pope. The result is another enjoyable pot-pourri of 68 poems. Janice has included nine of her own illustrations. The list of competition entrants whose poems are included is here. A collection of poems selected for their appeal both on the page and to the ear. The book is named after the Keystone Pub in Guildford where we host a monthly poetry night. "I have a list of my favourites from this anthology ... Hopefully the reader will buy a copy and select his/her own. These are fine poems to choose from." 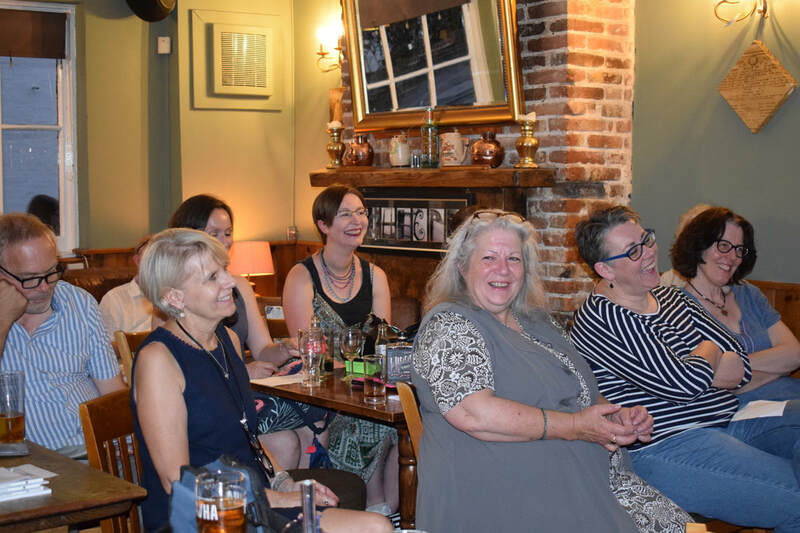 170 poems by 68 of the writers whose work has been heard at the POP UP POETRY events at the Bar Des Arts Wine Bar in Guildford. You’ll find rants and sonnets, haiku and prose poems, free verse, found poems, rhyming slam poems and love-songs, all co-existing amicably in these pages, just as they do on our platform. The perceived line between "page poems" and "performance poems" is ignored here, and the mix includes poems by frequently published poets and writers, as well as rappers, "stand-up poets", ranters and song-writers, all of them in love with words. This book adds another dimension to the art of the spoken word, just as performance adds a different dimension to the written page.